I say, Ahmad Said got the Menteri Besar seat because he threatened to jump ship with another assemblyman. This is an open secret in Terengganu. The kampung man, Ahmad Said will be retained as Menteri Besar until next election because BN cannot afford to lose Terengganu to PAS. 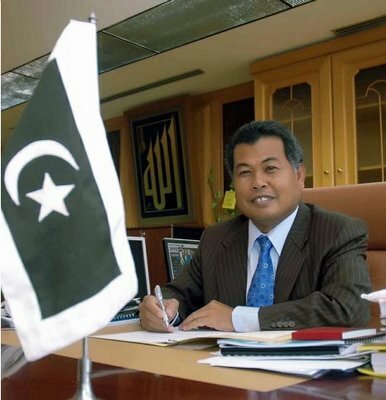 KUALA LUMPUR: Talk is rife that Terengganu Mentri Besar Datuk Seri Ahmad Said may soon be replaced, which may not bode well for the two-seat majority Barisan Nasional (BN) state government. According to a report in Sin Chew Daily today, given the slim majority in the state, BN is treading carefully as a change in allegiance by just two assemblymen is enough to cause the coalition to lose power in the state. In the 13th general election (GE13), the Ahmad Said-led state BN held onto power winning just 17 of the total 32 seats. A source told the daily that there was already talk right after GE13 that Ahmad Said would stay as mentri besar for only a year. Now with the one-year tenure coming to a close next month, all eyes are on whether he would be replaced. “It is learnt that Ahmad Said was not BN top leadership’s choice but due to certain agreement, the prime minister had allowed him to continue to lead the state (after GE13) with the condition that he steps down in a year,” said the source. Nevertheless, the source added, the BN top guns have to tread carefully on Ahmad Said’s position given the hair’s-breadth majority the coalition has in the state. BN has to consider the possibility that if he is forced to step down, Ahmad Said and assemblymen aligned to him may become PAS-friendly independents, allowing PAS to take power, the source pointed out. Should BN decide to have Ahmad Said replaced, his successor is likely to be picked from among three assemblymen who are Umno division chiefs – Datuk Mohd Jidin Shafee (Permaisuri), Nawi Mohamed (Hulu Besut) and Datuk Ahmad Razif Abd Rahman (Seberang Takir). Meanwhile, Ahmad Said said he was not aware of the speculation. He declined comment, saying anyone could spread any rumour on the internet.